Altar flowers dates are being filled, so sign up now. Placing flowers on the altar for our worship services is a wonderful way to honor someone you love and appreciate or to remember a departed loved one. 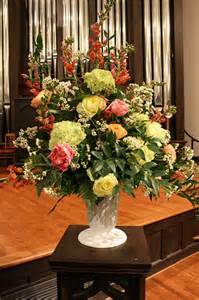 Arranging to place flowers is as simple as a phone call or email to the church office. Tell us what information you would like printed in the bulletin, we order the flowers, and the florist delivers them. You write a check for $50 for regular size or $70 for the large size, bring it by or send it to the church office, and you are done. Do you normally give online? Payment for floral arrangements can also be made by going to On-Line Giving and selecting “Flowers and Plants” from the secure Vanco menu. Please notify the church office that you have selected this option. Have a nice garden or access to floral arrangements, not a problem. All arrangements have to be delivered to the Sanctuary before noon Saturday, prior to services. Contact the church office at (512) 285-4503 for available dates.